The first group of players arrived in Indianapolis yesterday for the 2018 NFL Scouting Combine. There will be a new group of players arriving until Friday and the workout portion of the event ending next Monday when the defensive backs workout. Today the players who arrived yesterday will go through their medicals as well as get weighed and measured. With the Bills having five selections in the first three rounds, you can bet they will be looking at several players very closely. Obviously with a need at quarterback that group will be watched as close as any. The problem with watching the quarterbacks at Indy is that the throwing portion of the Combine doesn’t really tell us anything we don’t already know about the players at the QB position. Quarterback is a rhythm position and at Indy a quarterback never gets an opportunity to get into any kind of rhythm. He makes two throws, then goes to the back of the line and waits a few minutes until he gets two more throws. Last year. The Bills had private workouts with many of the top quarterbacks in the 2017 Draft Class. You can bet they will do the same this year starting next month. May have said they feel the Bills will try and use their bevy of draft picks to move up in the first round to draft a quarterback. Personally I don’t think that would be a wise decision as the quarterback class is not as strong as advertised and the cost to move up can be prohibitive. If they let the draft come to them they may end up with just as good a player. Obviously how the quarterbacks come off the board will be determined by what happens in free agency in two weeks. Until we know where the veterans are going there is no way to guess where the draft prospects will go. Patience is the key. That said, the quarterbacks the Bills could be watching closely this week are the obvious ones like Josh Rosen, Baker Mayfield, Sam Darnold and Josh Allen. A player who may be available at number 21 is Oklahoma State’s Mason Rudolph and if the Bills wait until the second round they could be looking at Kyle Lauletta from Richmond. There is a strong chance that Rudolph or Lauletta can be just as good if not better NFL players that the four guys generally regarded as the best in this class. If the Bills are looking for a backup and eventual replacement for Shady McCoy, this is the year to draft a running back. The depth of the running back class is excellent. Clubs will get a good player into the fifth round at that position. Some players who could go from the third round on at the position include Nyheim Hines from North Carolina State, Mark Walton from Miami, Jordan Chunn from Troy, Josh Adams form Notre Dame and Arkrum Wadley from Iowa. There might not be any tackles that get drafted in the top 10, but when a club is picking in the 20’s the value is there. Some guys for the late first round or the second round could be Tyrel Crosby form Oregon, Brian O’Neil from Pitt, Martinas Rankin from Mississippi State and Jamarco Jones from Ohio State. There could be a bunch of guards who fall in the late first and into the second round and that group includes Braden Smith form Auburn, Isaiah Wynn from Georgia and Will Hernandez from UTEP. The wide receiver class isn’t great if you’re drafting in the top 15, but for that point on there is depth. Calvin Ridley will be the first receiver selected and should go in the teens. After that the next five could come from this group: James Washington form Oklahoma State, Courtland Sutton from SMU, Dante Pettis from Washington, Christian Kirk from Texas A&M and Mike Gallup from Colorado. One area where the Bills have to get improvement is with their pass rush. They could attack that area in free agency or wait until the draft. In the 4-3 scheme the Bills play, some guys who could be available at 21 or 22 include Harold Landry from Boston College, Marcus Davenport from UTSA, and Sam Hubbard form Ohio State. In the second round they could be looking at guys such as Lorenzo Carter form Georgia or Duke Ejiofor from Wake Forest. 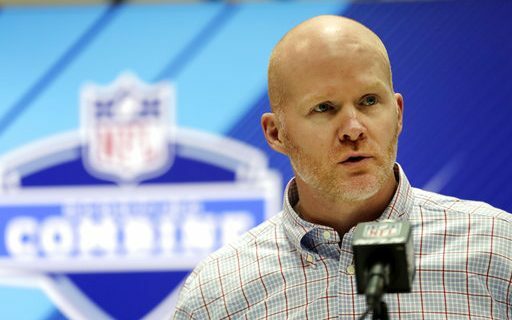 Looking at the linebacker position, I’m sure that Sean McDermott wants to get more speed into that position group. Assuming all these guys workout well later this week, Sean can find a player or two from that position group in the Draft. Some who could go from the second round on will be players such as Darius Leonard from South Carolina State, Leighton Vander Esch from Boise, Christian Sam from Arizona State and Dorian O’Daniel from Clemson. Corner is always a need and even though the Bills just signed Vontae Davis, they could lose E.J. Gaines in free agency. If that is the case the Bills will need to add depth. There should be value at the position in the second and third round and some who will be available could be Mike Hughes from Central Florida, Isaiah Oliver from Colorado (could go late one), Donte Jackson from LSU and Anthony Averett from Alabama. The workouts are always fun to watch at the Combine and actually the television view can be better than what the scouts see from the stands and the boxes they are in. With the Bills having as many picks as they have, especially in the premium spots, some of the standouts at Indy could very well be future Buffalo Bills.